Usual Price: $560. Promo Price: $390. Free GoPro 3 way mini tripod (worth $120). Free gift is while stock last. Free GoPro 3 way mini tripod (worth $120). Free gift is while stock last. We are Authorized GoPro Retailer in Singapore with Official GoPro Warranty. 1 Year GoPro Local Singapore and International Warranty. The second most advanced model in the GoPro HERO7 lineup and one of the most advanced action cameras of its time, the GoPro HERO7 Silver records 4K video at up to 30 fps, shoots 10MP photos, and offers many sophisticated features to go along with the image capture. 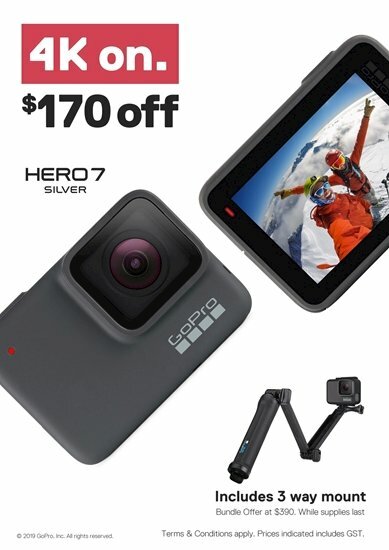 These features include digital stabilization for smoother video, voice control allowing for hands-free commands, a photo timer for individual and group selfies, and a GPS function that tracks your speed, distance, and other factors and lets you document these in the included GoPro app for iOS and Android. The camera is waterproof down to 33'/10M natively, without any housing required. It's rugged and rubberized and has an intuitive 2" touchscreen display on the rear. A Touch Zoom feature provides a quick and effective way of framing your shots using your fingers on the touchscreen. Other features include time-lapse capture, wide dynamic range (WDR), and a portrait mode which allows you to physically turn the camera into a portrait orientation and shoot portrait photos that you can seamlessly upload to Instagram, Snapchat, and other social media sites. The GoPro HERO7 Silver operates on a built-in rechargeable battery. Please see the Features section below for a list of all the features. Note: The GoPro HERO7 Silver does not support a Dive Housing. If you're looking to dive deeper than 33'/10 meter, please check out the HERO7 Black, which is compatible with a 200'/60 Meter GoPro dive housing. Note: The HERO7 Silver records 1440p resolution at 4:3 aspect ratio and this image can be cropped in the companion GoPro app to provide you with a 1080p60 / 1080p30 16:9 image. Copyright © 2019 7DayDeal. All rights reserved.